My thrumming adventure has been partially interrupted by a striped, stashbusting sweater for Beatrix that I started over a month ago. I decided to pair up some Knit Picks Merino Style with the Debbie Bliss Merino Aran that Nova sent me last year to make a toddler cardigan. Sadly, I had to set this aside for a few weeks because I ran out of yarn – both colors, in fact (yes, that was great planning). Unfortunately, I only needed a few yards of each new skein so you will likely see these colors again soon in some hat or another. 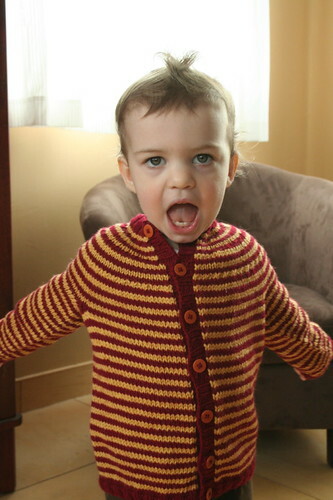 I regret that the severe yoke decreases show in spite of my careful blocking. I used three evenly spaced decreases to form the yoke and if I were to do it again, I would probably place four less aggressive decrease rows in there. Also, I skipped the back neck shaping and ended with a 2×2 rib collar. The knitting was terrifically mindless, the yarn was soft and I feel certain Beatrix will outgrow this far too soon for it to pill. I would neither recommend KP Merino Style nor DB Merino Aran for any project one expected to last, however. These are soft and fuzzy yarns, categorically not durable ones. Still, I am happy with the results. Its initial reception was not good, unfortunately. Beatrix maintained, “I don’t wike stwipes!” Fortunately, a two-year-old’s preferences seem to change as quickly as her moods and this morning, she deemed it acceptable attire. 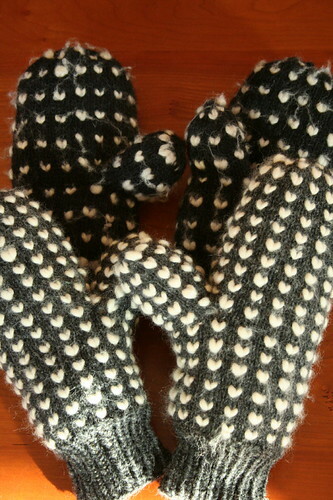 Returning to the thrumming activities, I happily report the mittens are done! And what a lot I have to say about them. I decided to go overboard on these to create the most densely packed, tightly knit, wind-proof mitten ever. Contrasted against the Yarn Forward mittens I made for Aaron last winter, these mittens pack an incredible amount of sheep. 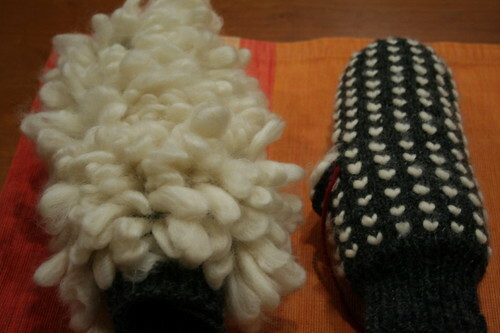 I made the 2008 pair with Lamb’s Pride Worsted on US 6 (4.0 mm) needles and each mitten contained 161 thrums. Of course I counted, you wouldn’t have? My only complaint about them is that the wind cuts through them on the coldest days. Consequently, I knit the 2009 pair with Ram Wools Selkirk on US 2.5 (3.0 mm) needles and nearly doubled the number of thrums. 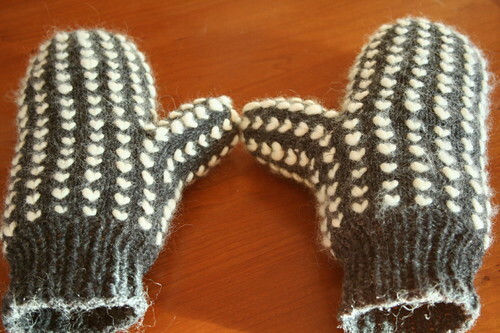 Each mitten contains exactly 300 thrums. I hope they will be sturdy enough to protect my aunt Therese from the bitter cold of watching early morning ice hockey practices and games. For the cuff, I cast on 32 sts, worked 3” in 1×1 rib. I increased to 42 stitches, thrummed every three stitches, every fourth row. After a few rows of thrums, I added one pattern repeat below the thumb to make a little more room. There are 252 thrums in the mitten body and 48 thrums in the 24-stitch thumb. I worked three K1, K2tog decrease rows at the mitten top and one at the thumb top. The sheer volume of material stuffed inside is astounding to me. You can see the contrast with the old pair. On the whole, I cannot say thrummed mittens wear well. As you can see, Aaron’s pair (oh, who are we kidding? they’re really mine) is in dire need of a shave. They pill and fuzz all over everything. They also grow with time, as the wool inside packs down. I cannot so much as turn a door handle wearing thrummed mittens, much less wrangle a toddler. However, I do not fear for my extremities when it’s -10 degrees during my 5:30 a.m. runs. That’s really all that matters, right? Therese will only be able to wave and clap with her new mittens but isn’t that all one needs to do at a hockey game? After knitting my first pair of thrummed mittens for Aaron last winter, I swore off knitting any more. 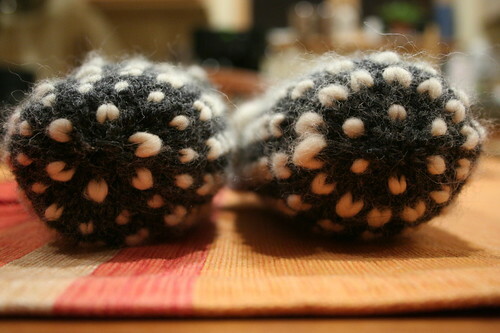 It took me an entire evening to make enough thrums for the pair of mittens and then, I found knitting them in too tedious for my taste. The resulting mitten is to die for, however, especially amid the bitter cold of winter. I wore Aaron’s mittens over some neoprene gloves on my early morning runs all last winter. 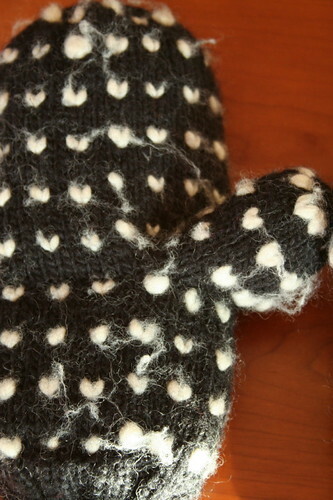 The other day, I was raving about these mittens when I realized it was time to make another pair. With any luck, they will be ready for the weekend! Have I mentioned my dislike for top-down sweaters? It’s true, I would rather knit from the bottom up. My dissatisfaction lies in the hem and cuffs. First, the stitches never look tight enough no matter how many needle sizes I drop. Second, my cast offs are always too tight. I have tried all the various bind offs out there and the only one that works adequately enough to get the garment over my hips is the sewn cast off, which yields an edge that invariably appears too loose and rather sloppy. Finally, no matter how I work the rib, my hems flip without a good blocking or gentle steaming. 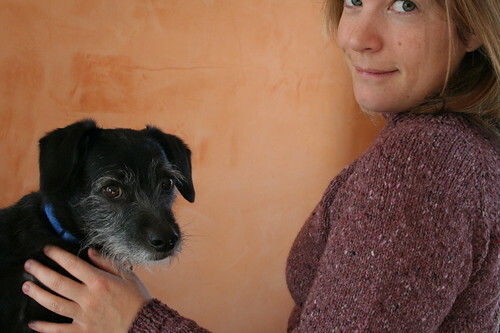 However, top-down sweaters are quick and fast and what do you know, I’ve just knit another one! I’m cold, remember? Actually, I knit this in December but I refused to finish it until I first settled on a finished hem for my Francis Revisited. 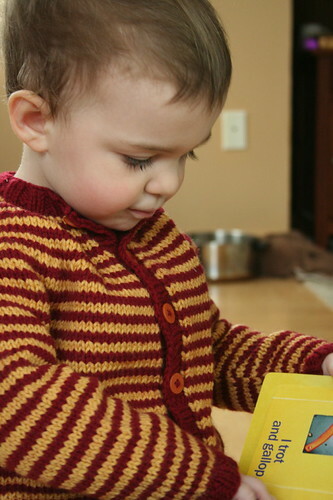 There is something about the top-down sweater that I find very appealing. It does not feel like a real sweater until I divide for the armholes. 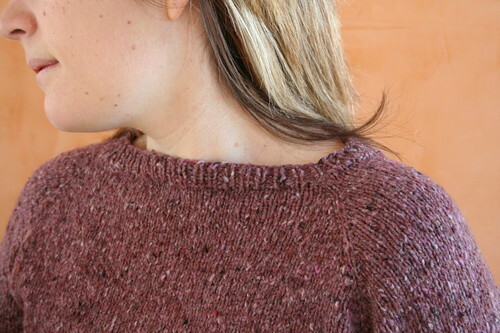 Perhaps there’s no commitment until the divide whereas I feel committed to an Adult Sweater as soon as I cast on all of the body stitches for a bottom-up garment. Who knows? Despite my grumblings about the hem and cuffs, I love this garment! I intend to live in it! The yarn is so soft and comfortable! 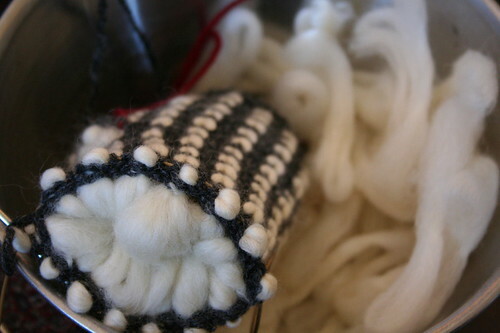 However, there are important things to note about the yarn itself. 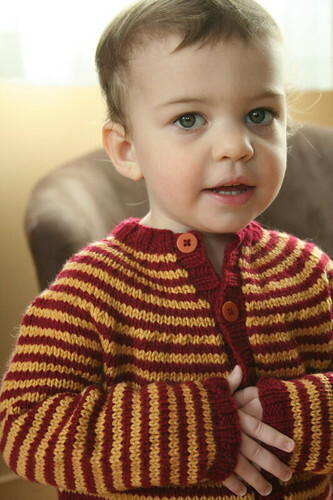 I used this same yarn in my DROPS 88-4 cardigan, a project from which I learned some important lessons. First, although my swatch last year grew, it did not grow nearly as much as the sweater did over the course of last winter. With this yarn on US 6 (4.0 mm) needles, my unwashed stitch gauge was 5.25 sts/inch, my washed stitch gauge was 5 sts/inch and the gauge taken from the stockinette part of the DROPS sweater was 4.89 stitches/inch! 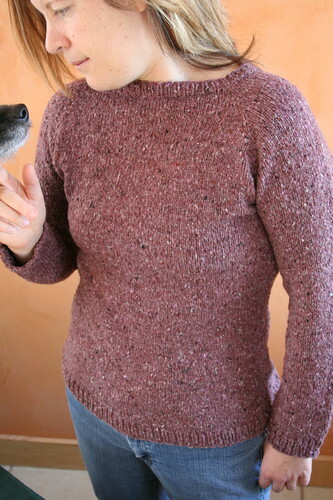 In planning this sweater, I used the 4.89 stitch/inch gauge and added 1.5″ of negative bust ease. When this grows, I will be prepared! 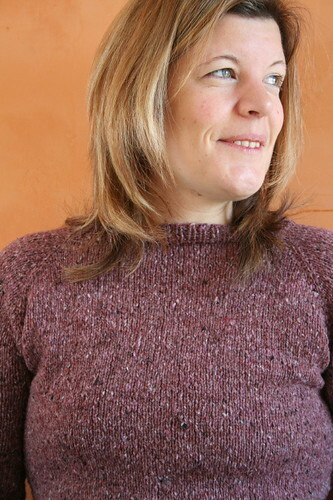 The neckline was even front and back but I used short rows on the ribbing to lengthen the back neck. After a blocking and a very, very gentle steaming, the bottom hem seems to stay in place. 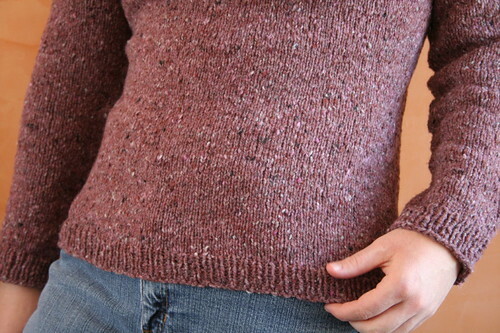 Still, you can see how my ribbing stitches appear loose and rather untidy. All in all, I will call this a successs. I believe the yarn makes this virtually foolproof. I originally intended to knit a cabled pullover with this yarn and I bought 11 balls. 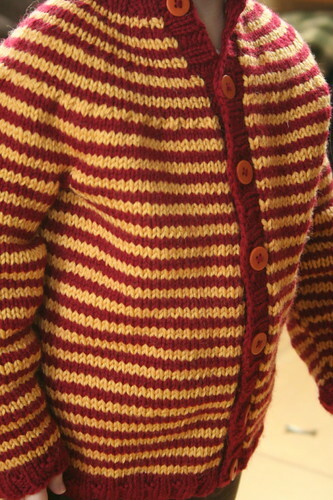 Since I only used 6 skeins for this sweater, I need to find a good way to use up my remaining stash. All stashed yarn needs a purpose, after all!